Like practically everyone else on the planet, I committed to eating healthier in 2016 as part of my New Year’s resolution. I’ve made this pledge in the past, but this is the first year I have a child whose diet also depends on my dietary choices, so I’m more determined than ever to stick with it. During the course of my healthy-eating research to find nutritious, delicious and somewhat simple ideas, I stumbled upon a recipe for zucchini noodles or zoodles that looked incredibly tasty and well within my skillset as a novice chef. The next day, I purchased a spiralizer (a handheld and inexpensive tool for turning vegetables into pasta-like ribbons) and before I knew it, I was making Pasta Bolognese and Pesto linguine using fresh zucchini in place of pre-packaged noodles. Talk about a time saver! Because you don’t have to boil any pasta, you save yourself the preparation time in addition to the extra dishes. 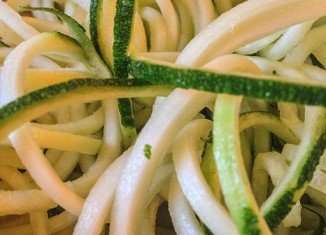 Simply spiralize your zucchini (I used two large zucchinis to feed my family of three) and mix the noodles into your sauce long enough for them to absorb the flavor. I know what you’re thinking, ‘there’s no way spiralized zucchini noodles taste as good or as filling as a hearty bowl of spaghetti.’ Wrong! It is just as satisfying and because you’re saving so many empty calories on the pasta, you can load up on healthy stuff like meat sauce, cheese and even a slice or two of (whole grain) garlic bread. Once you get into it, you’ll realize the list of fruits and vegetables you can spiralize is long and the possibilities are endless. Not only is it a healthy and fun way to incorporate vegetables into your family’s diet, it’s an excellent time-saver and leaves more room for everyone to focus on the important things, like…dessert!